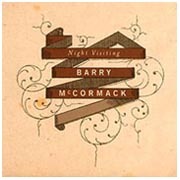 Night Visiting, the third solo album from former Jubilee Allstar Barry McCormack, is a collection of self-penned story songs and murder ballads that continues the songwriter's journey into the heart of the Irish song tradition. With Night Visiting McCormack has chosen to move the setting from the urban to the rural; these songs evoke a rustic landscape inhabited by a cast of strange characters inspired by folk songs, short stories and local histories, which comprise a skewed song cycle of murder ballads, parables and comic story songs—part Johnny Cash, part The Butcher Boy. Night Visiting begins with a murder ballad, 'Sean Ryan', in which a traveller is murdered for his shoes by the eponymous villain who revels in the brutality of his crime; while the album's penultimate song 'Tattersville' sees an unrepentant criminal facing the gallows and mocking the crowd who have gathered to watch. Between these songs we meet a host of characters involved in unsavoury incidents and unfortunate enounters. In 'Pilots' Hill' an ungrateful stepson murders and is murdered by his stepfather, 'The Road to Tyrellspass' (which is based on John McGahern's story 'Christmas') recounts the tale of a farmhand who absconds with his boss's mutant donkey, 'Encounter on the Road to Cobh' is a comic tale involving an arrogant guard, a cyclist and a heart attack, and in 'White Strand' the song's protagonist is murdered by two landlords and their agent. The pre-apocalyptic philosophising of a barfly in 'The Waxing of the Moon' ('Tomorrow we will be swallowed by the sea') and the random acts of violence throughout the record have a resonance with contemporary events as well as covering the classic themes of folk songs—murder, doom, revenge and betrayal. Recorded in engineer Rob Bochnik's studio in Wexford, Night Visiting features the virtuoso fiddle playing of Colm Mac Con Iomaire, whose five-string violin gives the songs an eerie and timeless feel. Also featured are Gary Fitzpatrick and Shane McGrath from The Sick and Indigent Song Club, who bring their own unique understanding of folk songs to the album, adding banjo, mandolin, accordion and some rousing backing vocals.